Outstanding Customer Service Is ALWAYS Fun – QBQ! GIVEAWAY!!! Comment to possibly win 6 (yes, six!) FREE QBQ! books! There are many terrific aspects of being an author/speaker. One is when people have an outstanding experience, they think of your message. Honoring! In this case, it’s about QBQ!-esque customer service. Enjoy this story from Travis, a true believer in the QBQ! 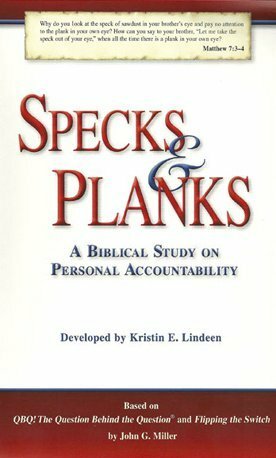 book and its message of Personal Accountability. John, I have an amazing “QBQ! moment” to share with you! My wife, Tammy, and I went to dinner in downtown Denver to a newish restaurant with our great friends, Tony and Robin. The place is the Blue Agave Grill and totally worth it! They are known not only for great food but for their margarita selections. None of us drink much but we thought, Well, when in Rome, so we each ordered a margarita to suit our own tastes. Tammy and our friend, Tony, asked for the identical cocktail which requires mint as an ingredient and garnish. We all reacted the same way. Okay, no big deal. Thanks for the freebies. But then, not five minutes later, the manager, Robert Duran, arrived with two new margaritas—and each contained mint. We were baffled. Robert proceeded to tell us a team member had run next door to the Cheesecake Factory to borrow some mint leaves to make the drinks that Tammy and Tony had requested. He said he really wanted us to have “the true experience of our restaurant.” And … the new cocktails were also on the house! I pulled Robert aside and asked if he knew the QBQ! book and if he didn’t, I would send him a copy from my stash (I always have some on hand to give away)—because he and his team had exemplified the QBQ! message. John, his book went in the mail today! Travis is right—this was and is QBQ! all the way, in every way. 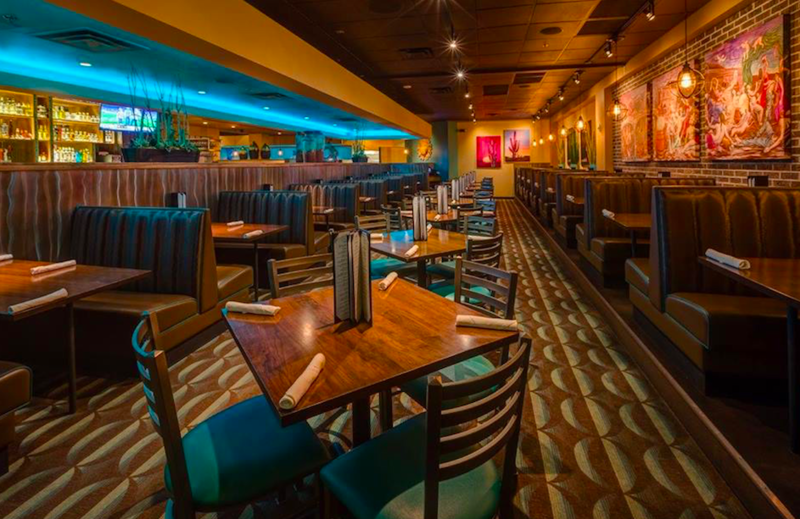 For those who know QBQ!, this marvelous and fun Blue Agave Grill moment is a mini-version of Chapter One where we share our “Jacob and the Diet Coke” Rockbottom Restaurant story, one very few readers forget. Have you read QBQ!? If so, great! But, do you have a stash like Travis? I mean, unless one has a stash, how can one give them away to deserving people?! Thanks to Travis for knowing QBQ! content, recognizing QBQ! in action, and rewarding QBQ! behavior. What a good guy! Post a comment here on our Blue Agave story or what QBQ! has meant to you and we’ll enter your name into our drawing to win 6 FREE QBQ! books! Drawing closes Monday, March 26, 2018 at 5 pm Eastern time. I have 2 copies left. One for me and one to loan out. I have given away at least 4 others! What a great story! I refer to QBQ almost on a daily basis with my staff! I have to get books in their hands soon! Love your emails and would love to finally read your book! I have read the QBQ book as requested by my manager. I love this book, puts a different prospective in customer service that we normally do not pay attention to. It has changed my mindset from questioning what others could do better or handle better, to what can I do better to better a customer’s experience. Everyone who handles customers, needs to read this book. I think what struck me most about this is that the person wanted to share the story of excellent customer service. So often, people will share the negative stories, but not the positive ones. I work for a large municipality and recently a citizen called in to share a story about an employee he witnessed help a young citizen. He was so impressed that the employee went out of his way to be of assistance to the young woman that he took time out of his day to make a call. Truth be told, the employees actions were likely not unusual – it’s probably something he does almost every day – but it goes unnoticed until that one person goes out of their way to recognize it. Everyone should take a moment to share a positive experience. Doing so will create more of them! QBQ has been the foundation of my career for perhaps 15 years now. My mentor spoke of it from the podium and I embraced it for my practice as the foundation of our culture. I now work with my mentor and enjoy the same amazing QBQ culture in this practice as a consultant. I have only one left to give out, so I would love to win more! I have shared the QBQ books with my husband, who is a manager, and my manager. They seem to keep getting loaned out to others so I purchased another one just for me! I LOVE what you said in praising Travis for KNOWING, RECOGNIZING and REWARDING QBQ behavior! That is yet another example of QBQ!! It’s just amazing how those ripples of encouragement go ‘on and out’ … and sometimes splash back to refresh those of us who have followed your message for years. I am in the service industry and started reading QBQ over 10 years ago. Loved the book (s), the mindset and reminders to exceed our customer expectations! I enjoy sharing the stories with my staff and receiving the e-mails! Thank you, John for these reminders to “delight our customers”! and PS I also purchased your other books too and my son read those on his own actually. Great to read Travis’ story. Each month I send my HR Team an article relevant to our day-to-day work. The last article dealt with “focusing your energy during a work crunch”. There was a sentence in the article that stated, don’t fall into a victim mentality, believing you have no choices. I used that to plug QBQ and offered a copy of the book to anyone who hadn’t read it. I was pleased to share the book with several teammates. To be honest, I don’t have a stash – unless you call my copy my stash. It has well worn pages from being loaned out frequently. While I’m not in a service industry per se, I often think of your food service examples and try to relate them for my team. John, your work is really great and should be present in every high school. Thanks for what you do and congrats on the free drinks! I am an agent for Delta Air Lines in Baggage Service. It is a work area where few come to tell you what a great job your airline is doing. On the contrary, it is a place where our customers come to inform us that their bag has been delayed, damaged or yes even taken by mistaken by another passenger. A couple of week ago, a top medallion gentleman came to me at our counter during a rather busy evening and said his bag was not on the carousel. I looked it up and confirmed with him that was indeed correct. It is coming in on the last flight of the night just after midnight. He informed me of his business at the Mayo Clinic and then he was driving back to MSP to leave on a flight to Houston the next evening. I took his claim and gave him the the paperwork and apologized. He looked at me and my name plate on my shirt and said, “Spencer, I need assurance from you that my bag is going to be at my hotel in Rochester tonight! What can you provide me?” I looked at him straight in the eye and replied, “You are looking at your assurance. Delta has a third party delivery service; which I am one of their drivers. If your bag is still here when I get off work at 1230am, I will personally drive it down to you as I have for two other passengers before.” The look and calm that came over his face was a “Kodak Moment”. He said, “Ok then.” When I arrived at his hotel a little after 3am, the front desk person said to me as I wheeled his bag into the lobby, “You must be Spencer! Mr. Newport said you’d be bringing his bag. He wants to be be called when you arrived.” He came down to personally thank me for being a man of my word. I told him that I grew up in a large successful funeral family and it was instilled into me from as early as I can remember that you only get one chance to do it right, so do it right the first time. A commitment made – a commitment met! I do it everyday with every customer because my joy comes by being a servant to our customers. They are the one that pay my check. Great story! I am a fan of the book and share the concepts regularly but have not thought of keeping a few books to hand out as well – Great idea! I tried, unsuccessfully to have my previous company (Direct Energy) bring John to a General Manager conference. Maybe I will have better luck at my new company, Service Experts. I have been following you since hearing about the QBQ during your interview on Dave Ramsey’s radio show many years ago. This Blue Agave story reminded me of a time when I worked at a mom & pop pizza restaurant near Phila PA. The owner would often under order certain perishable vegetables from his supplier. Luckily there was a local grown produce vender located nearby. I can’t tell you how often during busy times, one of us would run down to the “corner market” to buy fresh green peppers, onions, etc. so our customers would get the order they were promised. I loved this story for three reasons. One was that it shows how someone went out of their way to make it special for Tony and Tammy. This is great word of mouth advertising. Two was that Travis wanted others to know of Blue Agave Grill extra effort. The third reason is that in this day and age of only telling the negative stories that you, John, shared this extremely positive story to remind us that these stories and people are out there and should be recognized. Thank you. I believe Raising Accountable kids is one of the best parenting and self awareness book I read. And believe me I read a lot. Thanks for writing such a wonderful book. I think that it is great that Travis noticed the QBQ behavior and rewarded it; and even greater that Robert went out of his way to provide a “true Experience”. This is a great story! As someone who deals with customer service daily it is nice to know that when someone takes the extra incentive to ensure that service is exemplary it doesn’t go un-noticed. I encourage the QBQ attitude in my company on a daily basis and make it a point to praise/reward those who uphold the standards we have set. Great story! Made me think of dinner at Cowboy Star in Colorado Springs last Friday, where the servers made the dining experience as pleasant as the food was. If your customer feels valued, they’ll be a repeat customer! QBQ is a staple in my personal and professional toolkit, which includes the “drama triangle”, managing to strengths, love & logic and Deming’s approach to continuous improvement. As a QBQ advocate, I’m also learning to encourage system thinking as opposed to silo thinking to drive a joint sense of accountability to the customer receiving the product at the end of the process. I always stop and take time to ready your posts. 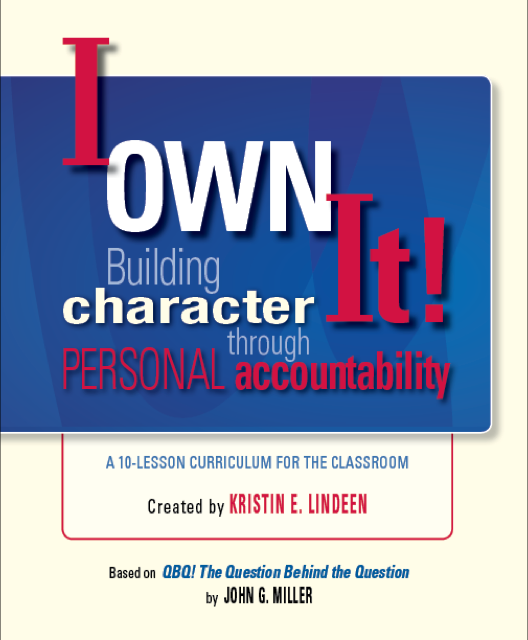 Inspiring examples and a great reminders on personal accountability! Your stories and examples of going above and beyond are always shared with the staff at our location. We also encourage everyone to subscribe to your emails and to read your book. Thanks for everything you do. Personal accountability, putting others above yourself is the essence of servant leadership. One will never go wrong with servant leadership! Thank you for this great story. It truly exemplifies great customer service. The QBQ book shows that great service can be done in any industry. I work in healthcare and it is very appropriate. As others have stated, we seem to only hear the negatives. After reading your book, the positives definitely stand out to me and keep me going back to my favorite businesses. 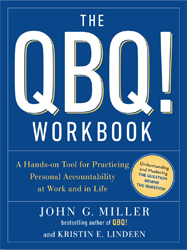 I recently read QBQ!, my employer has had classes/group reading with discussion over the years and unfortunately I was not with the company yet when they did the class with QBQ!. However, now I am enrolled in a class for Flipping the Switch. I wanted to read QBQ! before I started Flipping the Switch and I can certainly tell you I couldn’t have read this book at a better time. My employer strives on this type of mentality and great service. I make it priority daily to better myself not only within my career but as a person in general. This book has motivated me to dig deep within myself and ask those questions we are all often dancing around. So thank you for inspiring me. I will continuously be looking for more literature from your website. 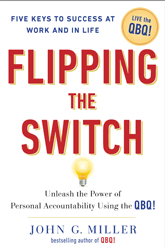 I look forward to reading through Flipping the Switch. I am now on chapter 6. Again, thank you! In my company, I teach Customer Service to the new employees and the value it has. It’s great to hear stories like this. I try to focus on not being a victim, but taking ownership of your new job, asking questions and gaining the skills necessary to do a great job. Thank you for the resource with QBQ. Love this story! Thanks for sharing. I love to read about people taking ownership and doing the right thing. To date I have given away over 100 of your books to our leadership and employees and everyone take something from it. 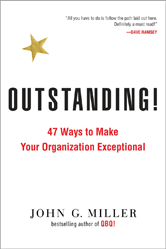 We are a guest service company where taking ownership is not an option and this book has helped our leaders support this message with their staff. What a wonderful story of exceptional customer service. Currently at work we doing the QBQ workbook. Almost everyone contributes and is learning this wonderful, simple concepts. Being accountable is helping our team to grow. For years now, I’ve given this book away to friends across the business strata. It’s principles fit our entire team. 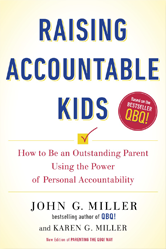 And, if you haven’t read the QBQ parenting version… well, it will pinch; its an in-your-face application of the QBQ to parenting. Another great Miller book; I have them all and re-read them regularly. I love the QBQ stories. I want to use it in a bible class to help others understand the power of questions. I love getting the QuickNotes and enjoy the stories. A few days ago, I presented some of your QBQ information about Responsibility, How to Have an Excellent Office, and 4 Questions People w/ a Career can Answer, Yes; to our staff and managers. Though I’m not management, all the managers thought it was great information to present to the staff, considering the changes that are taking place in our agency. Your information helped me re-affirm my belief that I have a career, not a job. Despite the major changes our agency is going through and how we support our customers/partners, I can answer all 4 questions with a big YES…most of the time. As soon as I got part way into the Blue Agave story I sensed its parallel with the Diet Coke story from QBQ. I keep QBQ in mind all the time. As an HR Administrator, I view each of our employees, our owners/clients, and anyone walking in the building as someone to serve to the best of my ability. I’ve loaned my copy of QBQ out and even taught I OWN IT at my previous job as a Juvenile Corrections Officer. And now dealing with sometimes irritable coworkers I will use one of the illustrations from the book to help them turn their perceived problem into an opportunity to rock their position. I have read and re-read your first book and have shared its specific chapters with my friends and kids. I live in Saudi Arabia and and am convinced that QBQ and personal responsibility has universal application. QBQ is not fashionable buzzword which has short shelf life but is time tested life style for all times. I gave QBQ to all my children along with The Total Money Makeover when they graduated from high school. I work with interns here in Japan and during one of my sessions with them, I talk about QBQ. I’ve given it away as a gift a few times. Currently I have two copies in my house here in Japan. Over the last 2 months, my stash of books has been depleted. At a recent Staff Retreat for the leaders of the nonprofit I work for, I gave several copies away. One copy went to the President Treasurer. Most recently, I gave copies to the group of single young professionals who meet in our home each week. What a perfect gift for these young men and women just getting started! My wife and I plan to live and work from an RV beginning this summer. There is no room for a library. However, there are some books that are a must. QBQ is going with us! Love the story that you shared about how someone in customer service going just a little out of their way can make someone’s day or experience so much more outstanding! I had the pleasure of hearing John speak quite a number of years ago (perhaps 15 or so!). We were in the process of introducing the QBQ concepts to our organization so his talk was extremely impactful. Now, many training programs of various kinds later, I can’t think of anything that has left more of a lasting impression than your work John. Its been a game changer in reframing personal accountability and redefining our standards for outstanding customer service. Love the regular stories and updates. Keep it coming! QBQ is contagious. 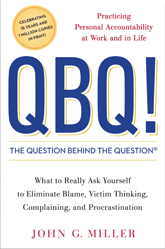 This book was part of a corporate training I attend and our organization truly embraced the QBQ way of doing business. It quickly became a core part of my everyday. No more seeking fault, just seeking solutions. I share lessons and stories with my adult children and the QBQ virus continues to spread. Thank you John for this amazing tool! I also have been witnessing these moments in customer service moments, and always immediately think of Outstanding. One that happened this week occurred at Home Depot. When buying certain sharp or pointy items there, the bags used at the checkout frequently rip and won’t contain the item. I’ve suggested before that they keep leftover boxes (used on the shelves in the store until empty) at the registers for these items. I’ve been told “we can’t, it’s against policy, they don’t want us storing stuff like that up there”. But this week, Kim E. at the Sunset Hills, MO location paused during bagging and grabbed a box from an area off to the side to put my pointy tubes of caulk in. I leaned in and said “thanks for someone finally doing this, even if it is against policy, it just makes so much sense”. She agreed with me and in chatting a bit more she tells me that she stashes larger boxes off in another area in the front of the store for larger items. Breaking corporate policy, but for the good of putting the customer first, and probably not causing any real harm. Outstanding! I hate to say I am a one trick pony but if I am speaking with anyone about good or bad customer service I seem to always turn the conversation to QBQ. It is always a part of my Monday morning meeting pep talk to our team. QBQ has opened my eyes to customer service in everyday life. I love the example in this story and in your books. I would hope all team leaders/supervisors would see the value of giving QBQ to their staff. The emails are a great reminder to help bring a culture change. “I must do something” will always solve more problems than “Something must be done.” – Anonymous. Working in construction, it is easy to fall into thinking that “I only do what I am paid to do.” Since hearing you present twice at our company meetings, it sticks with me that maybe there is added value to the customer/Owner that I can provide – a possible solution to an RFI, or a “Value Engineering” idea. Great story, thanks for sharing. Us service geeks love stories like this. I would love a “stash” of QBQ to give to newly hired team members in my organization. Customer service isn’t in my job description, but I fully believe that I have customers that I have to serve, and “how can I be better” is part of my daily review of my personal performance. How can I provide better service and how can I be a better customer. Thank you for sharing the QBQ message. I’ve worn out one copy of your book and have shared another many times. Thanks for the good work and for looking for the better side.